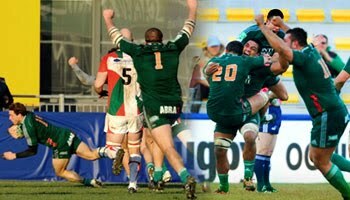 As we approach New Years Eve, the holiday season is almost over so we look forward to a big 2011, with plenty of fantastic rugby action coming up as well as a few big changes on RD. 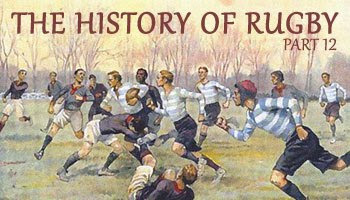 For now, here's the next in the popular History of Rugby series. It's been a slow few weeks in terms of fresh content on Rugbydump, but family visits and festive banter is now all but over, so the site will be back in business shortly, with daily updates and the best clips from around the world brought to you regularly. In 2011 we've got the World Cup in New Zealand, so before we look forward, lets take a look back to the last time the All Blacks won the tournament, in 1987. We also get to see the 1991 tournament, when the Wallabies won the first of their two titles. Two great captains, David Kirk and Nick Farr Jones, lifted the trophies in '87 and '91 respectively, and obviously going into 2011 we're all wondering if the host nation, led by Richie McCaw, can break the long drought for the Kiwis. Following this post, we'll keep the series coming as other parts are posted over time. Have a watch and feel free to discuss your predictions for next years tournament. Can New Zealand handle the pressure at home, or will it be another of the top ranked sides that manages to shatter the dream for the host nation? It’s Christmas time and while updates have been a little slower than usual here on Rugbydump, be assured that next year things will be back in full swing as the holiday season will be over. Your patience is appreciated. For now, here’s some much requested highlights from Leinster's great win over Clermont on the weekend. It was a bitterly cold night in Dublin as a record crowd turned out to soak up the festive atmosphere and watch their side produce a superb performance to knock over Clermont with a 24-8 victory, laying down a serious marker for the rest of the Heineken Cup. Two tries by Cian Healey and one by Sean O’Brien meant that Leinster took a grip on pool two and contributed towards ruining Clermont’s chances of an easy route to the next round. They missed out a bonus point, but importantly denied the visitors of one too. "The win is particularly satisfying because we stopped them getting a bonus point, so in the head to head we are 5-4 in front," said coach Joe Schmidt. "This week we were up for it more. We really had the bit between our teeth and were charging at them. It was a bit of trench warfare and great footy from both sides. We did go a little flat in the last 20 minutes but I think the intensity we brought, particularly in the first 20 minutes of the first and second halves, might have drained us a little and we just lost our shape." Devon Toner was impressive on the night, which bodes well for his World Cup chances with Ireland for 2011. "I’m just trying to do what I can for Leinster, I’m not looking any further," he said. Leinster play Ulster in the Magners League on the 27th of this month, shortly after the festive celebrations take place over the next few days. "We’ve got Christmas Day off, but we’ve got a match on 27th December against Ulster, we have to prepare for that so we won’t be eating too much," Toner added. As mentioned earlier, RD will be back in full swing shortly after New Year’s as once a year, things slow down a little around this time. All the best for the holiday season and if you’re celebrating, we'd like to wish you a very merry Christmas. As we attempt to bring you some highlights of the bigger games of the weekend, today we have a look at the tense 19-15 win by the Ospreys over Munster at the Liberty Stadium in Saturday’s Heineken Cup Pool 3 game. Ospreys flyhalf Dan Biggar kicked 14 points and converted Mike Phillips’ try, while for Munster, Tony Buckley and Keith Earls scored but it wasn’t enough as the Welsh region dominated the scrums up front in this edgy encounter. "We came out the other side of a lot of decisions at scrum-time. It was another disappointing aspect of the game. It's an area where we have improved greatly this season, and I think possibly this was a step backwards unfortunately," said Munster captain Denis Leamy. "I thought we had our chances. When we get down so close to their line, we need to be converting those chances. It's just disappointing - it didn't happen for us. We came here to win, and it's gutting really," he added. Ospreys will visit London Irish and host Toulon, while Munster still need to travel to Toulon, and host London Irish in this highly competitive group. 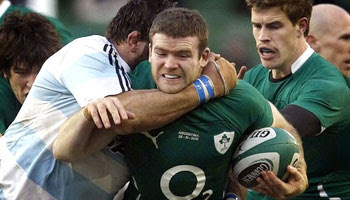 On a side note related to Munster, Paul O’Connell is set to appeal his four week suspension for the swinging arm on Jonathan Thomas in the previous meeting between these two sides. "Munster Rugby can confirm they have appealed the ERC disciplinary decision handed down to Paul O'Connell at last Thursday's ERC hearing in Dublin. 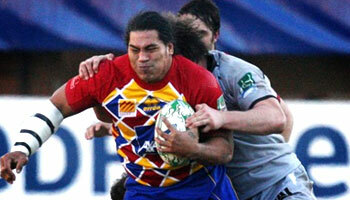 Munster Rugby now wait on the ERC to issue a date for the hearing," a statement read. Paris played host to a fascinating game of rugby on Friday night as Saracens came up with a 19-14 win over hosts Racing Metro. The match played in heavy snow that started early, and continued right up until the final whistle. Young Owen Farrell proved a key player for the Watford based side as he kicked the penalties on offer, slotted a drop goal, and converted Brad Barritt’s try. Racing Metro, who were down 16-0 at halftime, fought back in the second half but Saracens were able to hold them off as the snow came down. Saracens are still bottom of the table, but this first group win of the season will give them confidence in their ability going forward. It also will have done great things for Farrell, son of former England center Andy, who is looking impressive at number ten. The nineteen year old took the Man Of the Match honours in a game that was actually in doubt beforehand, due to the poor conditions. The ground staff made sure the surface was playable though, and did what they could during the game to make the pitch markings clear. It certainly wasn’t a normal day at the office for the majority of the players, many of which were from South Africa, where the beating sun and hard surfaces are usually what needs to be contended with. In one of the heaviest winters up north for some time, we’ll probably see more snow affected games over the next few weeks. Xavier Rush was red carded for a dangerous tackle on Courtney Lawes as Cardiff Blues went down 23-19 to the Northampton Saints at the Cardiff City Stadium this weekend. 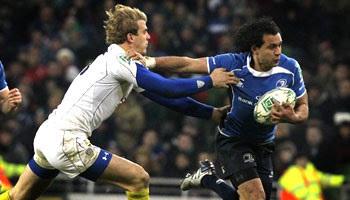 The result of the fierce contest effectively eliminated the Blues from the Heineken Cup. Rush, a former All Black number eight, saw red after he flew out the line to make a crucial momentum stopping tackle on lock Lawes as Saints were threatening after a move from deep. The hit virtually decapitated the England second rower though, who took it well considering the impact. He got up, played on, but left the field after less than ten minutes. It’s since been reported that he’s fine and suffered no ill effects. Rush on the other hand, could be in line for a citing following the red card that was shown to him by referee Jerome Garces. Lawes did dip into the tackle, but the Blues number eight - not known as a dirty player - was responsible for the point of contact, so unfortunately even if he would have hit chest high with Lawes standing upright, the result was ultimately dangerous. "It was a physically intimidating game but we didn't take a backward step," said Saints coach Jim Mallinder. He said Lawes was ‘okay’ after the controversial tackle. "It was a big hit and anyone who takes Courtney around the head needs to be fairly high! Rushie is an experienced player and he has gone into the tackle and taken Lawes's head off. He was probably committed to it," he added. Despite losing Rush, the Blues could have hung on for the win but errors and a late try cost them as they went down for their first home loss in 13 matches in the tournament. Do you think it was a harsh call to give a straight red, or did the officials get it right? Nick Evans was kind enough to take time out to catch up with RD ahead of a big rugby year, particularly in his native New Zealand. Among other things, he touched on his golfing prowess, an incredible dropgoal, and what it will take for the All Blacks to win the World Cup at home. RD: You’ve been in the UK a while now – how different is everyday life to what you experienced in New Zealand as a professional player? Nick: Rugby is the same wherever you are in the world. It’s all about running, kicking and contact and that doesn’t change whether you are playing in New Zealand, England or anywhere else for that matter. Off the pitch New Zealand is definitely more relaxed, that's for sure. No traffic, no stress and if you want Sky installed you can get it the next day. In England it's never that easy! With you seemingly out of the Test rugby picture, who would be your choice from the current crop to A) Play second fiddle to Carter at the World Cup, and B) Be the man to take over in the long run? Graham Henry has already gone with Stephen Donald as back up and it looks like he will be there for the World Cup. From a personal point of view I'd go with Colin Slade. He can play at both 10 and 15 and I'm a big fan of versatility. You never know what might happen in terms of injuries so quality cover in all positions is important and that's what Colin provides. In terms of the man to take over from Dan Carter I think it's still a bit early to tell. It's a tricky one because those are going to be big boots to fill so let's wait and see. With next year’s World Cup in mind, what do you think will be the best way for New Zealand to deal with the immense pressure that will be placed on them at home, and who is best placed to challenge them? The best way to deal with the pressure is to embrace it. In 2007 we shut ourselves off and by doing that it became more intense. It's going to be a huge occasion but it's important for the guys to try and enjoy as much of it as they can. South Africa and Australia are probably best placed to challenge New Zealand. 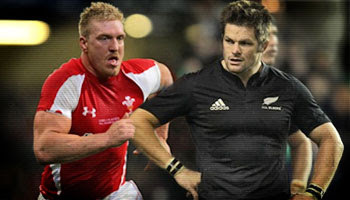 Both have beaten the Kiwis in the last couple of years and will take a lot of confidence from those results. Having said that I don't see anyone stopping New Zealand in their own backyard next year. Was the decision to not return to NZ - to give the World Cup a shot - a difficult one to make, or one that was never really something you considered? It was the hardest rugby decision I’ve ever had to make. I knew when I signed a three year deal with Quins that I would be hard pushed to get back in the team for the World Cup however, looking back I don’t regret the decision at all. England’s forgotten man, Danny Cipriani, will play for the Melbourne Rebels in the Super Rugby tournament next year – what advice would you give to Northern Hemisphere players who make a similar move? It’s a great move for young and upcoming players to experience life and rugby in the southern hemisphere. There are noticeable differences in the way the game is coached with real emphasis placed on developing the core skills. It’s a gutsy move for Danny to make but if he applies himself in the right way he’ll return to England a better player. No one individual is bigger than the team in Australia and if he finds himself in the spotlight for non-rugby reasons that won’t go down well. What’s life at Harlequins like since Bloodgate? Forgotten about, or a valuable lesson that’s made everyone closer as a result? It’s forgotten about and now it is up to us, as players, to continue rebuilding the reputation of the club on the pitch by performing well in both domestic and European competition. The feeling around the training ground is very good at the moment and long may that continue. 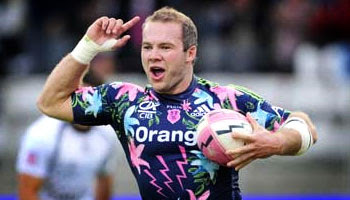 Talk us through that dropgoal you slotted against Stade Francais in 2008. Where do I start? It was one of the most exciting games I’ve been involved in and the finish wasn’t bad either! I still wonder how that final play lasted 29 phases in such terrible conditions. We could have dropped the ball, we almost scored in the corner – anything could have happened. I thought about the drop goal twice but both times decided we were still a little too far out. The team dug deep and thankfully I was able to get it over. It was a great moment for the players, the fans and the whole club. Having turned 30 a few months back, have you put a number on how much longer you aim to play professional rugby? You do think about it but as long as I am enjoying training and working with the guys then that is what matters. I would be happy with four or five more years but as long as the body holds up the sky is the limit. Do you manage to get out on the golf course much these days, and what’s your handicap? Yeah I do. Myself and Tom Williams play together and usually take on the forwards, Matt Cairns and Mark Lambert. I play off 15 but Matt’s handicap is 6. Just for the record the backs are 5-2 up at the moment! Brendan Venter – comedian, headcase, or revolutionary? As a rugby man you have to give him a lot of respect for what he has achieved in the game. I did see the interview he gave the other day and it was very strange but heh, that’s the sort of thing that makes him who he is. 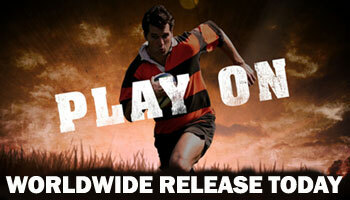 A few months back we announced that Play On, a new rugby movie, was to have an online worldwide screening soon. 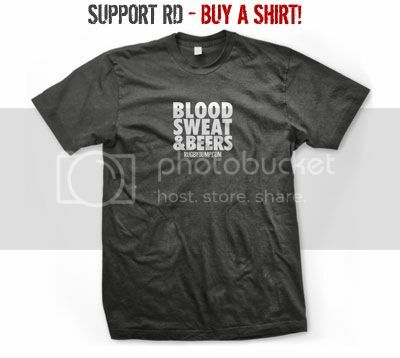 The good news is that today is the launch day, and you can get 15% off your purchase through Rugbydump. By watching it you'll also be in line to win a trip to New Zealand for the Rugby World Cup next year! Since we first spoke about it, news of this new rugby movie, Play On, has spread worldwide with publicity events and media interest growing rapidly. Last month there was the official first viewing at the premiere in Galashiels in the Borders region in Scotland, which was attended by the actors, producers, rugby legends, and even a few current professional players. The reception was great and there are now a few high profile former players backing the film in an effort to help the global rugby community be exposed to it. Today, for the first time, you too can watch it online by heading over to the official site and purchasing it for a more than reasonable fee. Use the coupon code RUGBYDUMP when purchasing to get a generous 15% off off the screening. If that's not enough to convince you, when doing so you'll be entered into the draw to win a trip to the World Cup in New Zealand in 2011! In summary, you're getting to watch a new rugby movie online for a discounted fee, as well as giving yourself a chance of being in Auckland for the semi finals of the Rugby World Cup. On top of that, it's simple to watch. All you need is a computer and a flash enabled browser. You can find all the info you need by visiting the Play On website, or skip straight to the purchase of the screening now, and don't forget to claim your discount with the coupon code! Everyone who purchases a screening of Play On will be automatically entered to win a free trip for two to New Zealand, including travel provided by The Rugby Travel Company and accommodation, including a ticket to each of the semi-final matches. Tomorrow Toulon host London Irish in a crucial pool 3 game that will effectively decide if Irish will continue in the Heineken Cup or not. 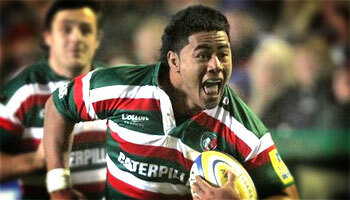 Last weekend Toulon got the better of them, winning 19-13 at the Madejski Stadium. Jonny Wilkinson was destroyer in chief, while Joe Van Niekerk put in a performance that will have quite possibly put the forgotten man of Springbok rugby back on the map. 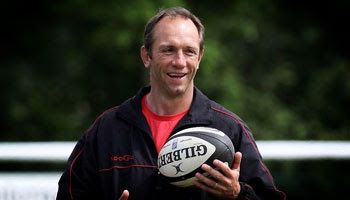 The same can be said for Wilkinson and England, as he showed that he is anything but over the hill, as some have suggested he is at this stage in his career. 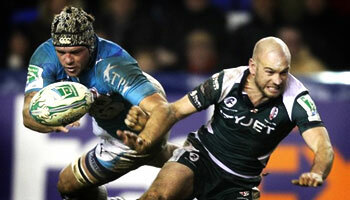 "Jonny gets better with age, like a fine wine," said London Irish coach Toby Booth. "He didn't look in decline to me. I saw him stop George Stowers on the short side 10 metres out... I think he's actually getting a bit better. He's like a fine wine,” he added, before reflecting on Van Niekerk’s performance. "He was the difference between the teams, to be fair. It's fairly evident that their game plan revolves around him, and while we knew what was coming, he caused us massive problems. In a hard-fought, competitive contest, he was the true quality act. Sometimes, you have to put up your hand and admit these things," said Booth. Van Niekerk himself was all about praise for Wilkinson. "You can't say any more about Wilko, the guy's a genius. What more do you want from a 10 than keeping the scoreboard rolling? It's a privilege and an honour to play with a guy like that. Jonny is still world class." Crashing to their sixth defeat in a row, the Exiles were in fact lucky to not go down by a larger margin as Toulon missed a few chances that should probably have been put away. This weekend London Irish will be going for the win as they visit Toulon at the Stade Felix Mayol for a game that is vital for the visitors to win, something Booth is well aware of. "It's a cup final. Realistically we're going to find it difficult if we don't get a result so we know what we have to do. From a Heineken Cup point-of-view, it's a 'do or die' situation." Leinster were beaten 20-13 by Clermont Auvergne on the weekend but managed to salvage a losing bonus point ahead of their return Heineken Cup meeting in Dublin. The Irish side remain top of Pool two. Wing Shane Horgan scored early on for the visitors before Julien Malzieu crossed for a try that was converted by Morgan Parra. Penalties followed, with the halftime scored locked t 10-10 after a tense first forty. A second Clermont try was scored by Anthony Floch. Jonathan Sexton and Parra then exchanged penalties, but Leinster couldn’t get close enough to take the win. Coach Joe Schmidt has said that his side were ‘absolutely gutted’ at the result, but they did okay. "I'm proud of them. Sometimes you don't get what you set out to try to achieve and it is frustrating but you can keep your head up when you try to your maximum. They deserved it. "We feel we didn't quite get the rub of the green - a few things didn't quite go our way. "We do, at the same time, take our hats off to Clermont. You know once they get momentum - and they got two very good tries - that they will be hard to stop." The two sides meet again this coming weekend at the Aviva Stadium on Saturday. Elsewhere, Paul O’Connell has been handed a four week suspension after he lashed out at Jonathan Thomas in Munster’s game against Ospreys this past weekend. They have the right to appeal, but team manager Shaun Payne has said they will wait for the written statement before assessing the situation further. By now you’ve probably already watched the now infamous Brendan Venter interview from the weekend. This is the Heineken Cup game that preceded the theatrics, as Racing Metro beat Saracens 24-12 at Vicarage Road. It was the third straight defeat for Saracens, who now have no chance of qualifying for the quarter finals of the highly competitive tournament. The two sides will meet again on Friday night, this time in Paris, but it will be somewhat of a dead rubber unfortunately. Things could have been different though if not for a few blunders and somewhat of an injury crisis. Venter, who kept mum to Sky Sports directly after the game, later heaped praise on some of the youngsters that have come through for the club. "The Heineken Cup is a magnificent competition, one that gives you the chance to test yourselves against the very best in Europe. Once again we've witnessed how our young players have stepped up to the mark, a testament to many years of hard work by our academy staff," he said. Since the game, Venter has been warned by the ERC over his future conduct in interviews. "ERC would like to point out that it expects key representatives of clubs participating in its tournaments to engage with the media in a co-operative and respectful manner. It is therefore disappointed by Mr Venter's approach throughout the interview," a statement read. "ERC has asked Saracens to confirm that Mr Venter will not adopt the same approach, or one in anyway similar, when giving media interviews before or after Friday's Heineken Cup Pool 3 game between Racing Metro 92 and Saracens." Martin Gillingham, the man behind the mic for that interview, has since said that he had no idea what was going on. "You know how it goes, at the time you're listening but it doesn't sink in because of the adrenaline. I thought it was a bit strange, and when we stopped, I turned around and saw the dropped jaws. Then it sank in," the Sky Sports commentator said. You can watch that interview here, and highlights from the match below. Three cheers for Sireli Bobo. Very good. Very good. One of the biggest upsets of the weekend, and perhaps the season, happened on Saturday in a Heineken Cup Pool 4 game as Aironi produced a dramatic 28-27 win over last season’s finalists, Biarritz. Italian side Aironi have done well since joining the Magners League, putting in some impressive performances at home, and now having come up with a Heineken Cup scalp of top French side. A drop goal from fullback Julien Laharrague with time almost up ensured that they snatched the win after a hard fought game, with Italy coach Nick Mallet watching on from the stands. Biarritz did score four tries and came within seven points so they left with two losing bonus points, but will have been disappointed to go down to a less fancied side. For the home side though, it was a great achievement and showed that they’re making good progress. "It was a huge win for us on two fronts. It was the first win of the season for the club and now we can look forward with real confidence," said Marco Bortolami. "Secondly, we proved ourselves against last season’s Heineken Cup finalists and that is huge for us. We proved that we have quality and that we can play and it brings the self belief back into the team." Bortolami attributes the new standard of play to coach Rowland Phillips. "In just a few weeks Rowland has really turned things around here," he said of the former Welsh flanker. "His personality, his coaching technique and the way he approaches things come across very well and we all really respect him. "I come from playing in England with the British mentality to training and playing and now Rowland is bringing this to the club and all the players are right behind it. "I think you can see from our recent performances – especially this last weekend – just what he was brought to the team," he said. These highlights are in Italian, so most of you won’t understand but there are some great moments that make it worth watching, none more so than the exciting finish and reactions of the players after sealing the big win. Leicester went down 24-19 to Perpignan on the weekend in an extraordinary Heineken Cup game that showed that the power of the scrum still can have a massive impact on the result. This clip shows the disastrous lead up to the first try, and then the other two as well. It was a fairly uneventful first half but after a neat Jerome Porical chip over the top forced Scott Hamilton to take the ball over for a five metre scrum, Perpignan were then given the opportunity to asert themselves up front. They did just that, as penalty after penalty were given and after going up repeatedly, referee Alan Lewis eventually decided to warn, and subsequently yellow card both hookers. It was a fascinating sequence of play that the tradisionalist and front rowers out there will no doubt love dissecting. It did however eventually come right, and the ball was moved to the backs, resulting in a great crosskick and try for Adrien Plante. Leicester prop Dan Cole was pulled from the park at half time, with Perpignan’s Perry Freshwater having relished the confrontation. "That run up to half-time was tough. We were trying to get going, but in France we tend to push up a little bit. We were trying to get on top of them, but he yellow-carded the two hookers. We tried again and luckily we scored from it," Freshwater said. "I’m a big admirer of Dan Cole. He’s been doing fantastic things. I don’t think he’s there yet, but I think he’s a very good player, and ‘Castro’, when he came off the bench. "All our second rows push extremely hard at Perpignan and we put big emphasis on the back row staying with us for this game. We knew the scrum would be a big battleground. It makes a real big difference when we push as an eight," he added. Jerome Porical later crossed for a well worked try, as did Geordan Murphy for the Tigers. Toby Flood and Porical exchanged penalties, but a late long-range miss from Porical meant that Leicester at least left with a losing bonus point. 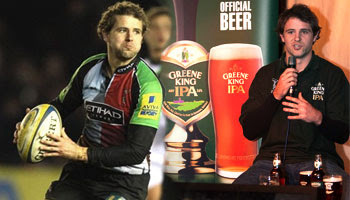 The two sides meet again at Welford Road this coming weekend. If you're a regular on here, you'll know by now that the premise of Rugbydump is not to show highlights of every single game that takes place, but rather to feature the best clips with the most interesting pieces of action for rugby fans around the world. So if you spotted anything else on the weekend that you think should be featured, please get in touch with details. Munster’s Paul O’Connell saw red within a few minutes of returning to Heineken Cup rugby last night, after a lengthy injury layoff had resigned him to the side lines for six months. 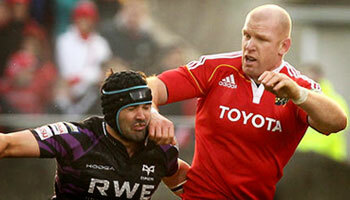 The return to action, and the 22-16 win over the Ospreys, was marred though by his swinging arm on Jonathan Thomas. British & Irish Lions captain O’Connell will face a disciplinary hearing sometime this week that will determine whether or not he receives further punishment after receiving the card for lashing out at Thomas, who was holding him from behind. The experienced second rower had his back to Thomas and while he pleaded his innocence to referee Christophe Berdos, he unfortunately did catch the Ospreys forward quite badly in the face, causing him to slump to his knees. It didn’t seem malicious, but was reckless, so you’d think that will play probably play in O’Connell’s favour when it comes to the hearing. If things don’t go well for him though, he could find himself missing the start of the Six Nations, which kicks off in just eight weeks’ time. Munster coach Tony McGahan said after the match they’ll let the process take place and deal with the outcome then. "We only had a brief look at it. We really haven’t looked at in depth enough to give any real comment. I suppose we saw what everyone else saw, a holding onto the jersey, a reaction towards that. "We’ll have to let the process take its course and we’ll abide by whatever decision is given." Ospreys forwards coach Jonathan Humphreys said that O’Connell is not a dirty player, but he will likely miss a ‘large chunk of the season’. "A similar thing happened to Gavin Henson for a similar incident and unfortunately he got 10 weeks for that," added Humphreys, hinting that O'Connell will be out for some time. What's your opinion on the red card, and do you think he'll get a hefty suspension? WIN tickets to the next round of the Heineken Cup by joining the Rugbydump mailing list. We have tickets to six different matches around the UK, so have a look at which game you'd like to attend, and enter now! New Zealand retained their South Africa Sevens title as they beat England 22-19 in a dramatic game in the George leg of the IRB Sevens World Series on Saturday. A last gasp penalty by Tomasi Cama was the only thing that could separate the two after full time as they were locked at 19 apiece. Cama slotted the dropkick in the fourth minute of injury time to seal the victory for New Zealand, who won in George for the fourth time in five years. England, sticking to their bright new kits, were hoping to take their second successive tournament for the first time ever but upon reaching the final were edged out by the more experienced side. The Dubai champions had actually led 14-0 before the men in black came back into contention with some great tries. "To play finals footy in front of an awesome crowd like this and take it right down to the last second, it was definitely a pleasing moment," said New Zealand captain DJ Forbes. "They are well-coached, well-drilled and they've got a lot of tricks up their sleeve. "I guess to knuckle down and beat them back to back is definitely credit to the boys." New Zealand played the last minute with a player less but managed to work a penalty after England had infringed at the ruck. "We had to take it," said coach Gordon Tietjens. "We were down to six men and it was unlikely we were going to break down the English defense in the end there. He's (Cama) been kicking well, so we gave it a crack and it won us the game." England lead the series standings, with New Zealand now behind them in second, and Samoa in third. The next event is in Wellington from February 4th. This will most likely have been the last of it’s kind in George, as the agreement is up for renewal. Cape Town looks like they could be favourites to host future SA Sevens legs. Controversial Saracens Director of Rugby Brendan Venter gave a bizarre interview after last night’s loss to Racing Metro in Round 3 of the Heineken Cup. Venter was fined recently by the ERC for outspoken comments. This was apparently his retort. The farcical interview came after his side went down 24-21 to Racing Metro in what was a disappointing home defeat for the London club. Sireli Bobo scored a great try to clinch it. Venter, a former Springbok center and qualified doctor, has never been shy to speak his mind. He has somewhat of a history with the media, recently being fined £23 000 for his comments on refereeing standards after their game against Leinster. So rather than say anything wrong, Venter chose to make a mockery of the clichéd after match interview routine by repeating everything that was asked of him, using a sarcastic tone that left viewers gobsmacked and dodged answering the questions. Unfortunately players and coaches aren’t allowed to say what they feel about matches and officials. They are fined if they speak their mind or give honest feedback when pushed by persistent interviewers who, at times, seem as though they’re oblivious to the regulations in place. This latest episode won’t go down too well though but it has provided another piece of comical entertainment for those who back the cause of being able to speak freely when asked to. His sarcastic comments on Sireli Bobo's try were perhaps the bluntest part of the interview. "Bit of Genius. A bit of magic. Sireli Bombo, very interesting, very good ja. Very good.. Three cheers for Sireli Bombo. Very good, very good," Venter said. The coach announced earlier this month that he’ll be leaving his post at Saracens to return home to South Africa for family reasons. Whether this latest controversy has him in hot water or not remains to be seen. It's been a challenging few days as travel and one or two technical probems have meant that RD hasn't been updated as often as what you're all used to. Thanks for the patience. For now, lets get things back on track with short highlights from last nights pool 6 Heineken Cup game that produced some excellent tries. Toulouse beat hosts Glasgow Warriors 28-16 in what was ultimately a comfortable win for the defending champions on a freezing night in Glasgow. They missed out on a bonus point though after failing to capitlise on their 25-16 halftime lead. 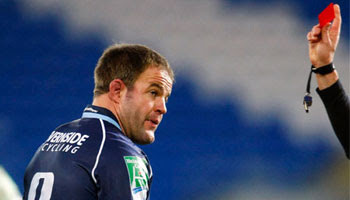 "We had a very good first half, but the second half was all about frustration," said Toulouse scrumhalf Byron Kelleher. "We put a lot of pressure on ourselves to perform to the maximum." In the first half Glasgow produced a fantastic piece of play as wing Dth Van De Merwe chipped and regathered before offloading for Max Evans to put a deft kick through which Federico Aramburu claimed to go over. Toulouse weren't to be outdone though as Kelleher snatched a ball off the back of a scrum and darted downfield before linking with the backs who eventually set up Cedric Heymans for a superb counter attacking try. 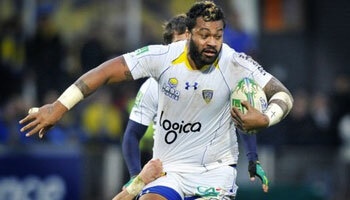 The win is the third out of three for Toulouse in this years Heineken Cup campaign. While the November Internationals for 2010 are now a thing of the past and we look towards the fascinating Heineken Cup, there were a few moments that stood out over the past month. This is one of them, from a player that's fast becoming an integral part of the number one ranked side in the world. All Black Jerome Kaino is now part of a dominant loose trio that includes the formidable talents of Kieran Read and the latest IRB Player of the Year, captain Richie McCaw. The three of them have, as with most of the side, have had a great few months and injuries and form permitting, will no doubt form a powerful partnership heading into a World Cup season. Kaino, who played a large part of his rugby at number eight, is now firmly securing his place in the team as a blindside who not only carries and links well, but is uncompromising on defence. With the upcoming Super 15 being the next bit of rugby he'll be involved in, Auckland Blues coach Pat Lam has insisted that after seeing how well he's been playing at number six, they won't be messing about with the 27 year old at eight any longer. "He's proven he's one of the world's best number sixes and that's one of the reasons why we stacked the number eight position," Lam said of his plans for the Blues squad. "I don't really want to move Jerome there." The last few games have been huge for Kaino, who alongside Read and McCaw has shown that the All Blacks possess quite possibly the most well balanced loose trio in world rugby currently. His hit on Bradley Davies against Wales rocked the big second rower, causing a turnover from which the All Blacks counter attacked in typical fashion. It was a significant moment in what turned out to be yet another successful Grand Slam tour for the All Blacks. Rupeni Caucaunibuca made his first start for Toulouse in the Top 14 on Saturday as his new team went down 32-25 to Clermont. To compound matters, the former Fiji star was yellow carded for a dangerous high tackle. In what was a shock move for most, the troublesome - yet extremely gifted - Caucau was taken in by Toulouse after Agen wanted nothing else to do with him. In a career that has been a bit of a rollercoaster, he’s been given the opportunity at the biggest team since he was an Auckland Blues player many years back. Far from being in his best shape, Toulouse insisted they could slim him down and he’s apparently already shed a lot of the extra baggage picked up over the years. He did score a try for the French Barbarians against Tonga last weekend, but it wasn't quite in the same fashion we were all treated to in his earlier days. He did last 50 minutes in that game though, surprising his new manager Guy Noves. "I didn't think he could last 50 minutes - I thought he would only play 30," he said. Against Clermont they played him at second center but after just 13 minutes he was sent from the field after this reckless high tackle on Julien Malzieu couldn't go unpunished. Luckily neither player was injured, but it initially had the look of something that caused have caused some damage. There was a nice touch afterwards though as Caucau, on his way to the sin bin, went over to apologise to Malzieu. Hopefully we’ll see more of the incredibly talented Fijian over the course of the next year. Class is permanent and there’s no doubt that rugby fans all over the world will be keeping an eager eye on his progress as he attempts to get back in shape and stay on the straight and narrow. Young Welsh flanker Justin Tipuric scored his first Magners League try in style on the weekend as Ospreys beat Edinburgh 33-16 at the Liberty Stadium. The try was top quality, and many have tipped Tipuric to be a future Test rugby star. A few weeks back Scott Johnson, Ospreys Director of Coaching, went out of his way to say that he feels the 21 year old could yet sneak into the Wales squad for the World Cup. "Don't rule it out. He's a wonderful player," said Johnson. "Martyn Williams has been such a wonderful player that logic suggests it should be hard for Wales to replace such a special individual. But the reality is they are very, very fortunate as regards potential replacements. "I think Tipuric is going to be a special international player," he added. The talk now is off Tipuric taking over from 34 year old Marty Holah at Ospreys when he leaves, but before that, senior honours may be on the cards. His ball carrying and stealing ability was on show against Edinburgh, and the wonderful try topped off a great personal performance. "We have a special talent there who has all-round ability," said coach Sean Holley. "He showed some class against Edinburgh and his try was sublime. You don't often see something like that from many back rowers, especially in those conditions." Tipuric himself has paid tribute to the superb hands of prop Duncan Jones, who delivered a perfectly timed pass the likes of James Hook would have been proud of. "I was just coming around the corner, talking to Duncan and he gave me an absolutely brilliant pass to be honest, great hands on him" he explained. "I could see the fullback coming up at speed and the space behind so I thought I'd go for the chip. I was just hoping then that it would bounce up into my hands and it did. The fullback slipped, luckily, and I was over the line. "You've just got to play what's in front of you and see what happens," he added. England came back from being 21-12 down to beat Samoa 29-21 in the Dubai Sevens final on Saturday, claiming the tournament win over the reigning champions and picking up their first tournament win in Dubai since 2005. The England side suffered an early setback when Portugal beat them in what was one of the biggest upsets seen on the Sevens circuit in years. A switch to the maligned orange jersey seemed to kick them into gear and things went right from there on, even if the results were tight. A narrow win over Fiji and then similar wins over Australia in the quarters, and New Zealand in the semis meant that England progressed to the final to put their Commonwealth Games disappointment behind them. "A couple of the senior management were here from Twickenham. Hopefully we have converted them. Maybe the worm has turned for England sevens and you will see a new chapter. This is a pretty exciting time for all of us," said coach Ben Ryan. "Hopefully we can stir the England Sevens beast to be a pretty powerful weapon over the years for England rugby." In the final young Harlequins scrumhalf Oliver Lindsay-Hague scored twice with Simon Hunt, Dan Norton, and Mat Turner also crossing for important tries. "We bounced back well and I couldn't be more proud of the boys," said England captain and Sevens veteran, Ben Gollings. This video gives a nice summary of the games leading to the final, and the main match itself. 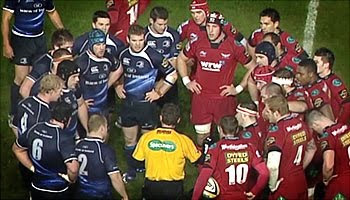 Leinster and Scarlets played to a 17-17 draw on Friday night at the Parc y Scarlets in what was an ill-tempered game. In the first half referee Nigel Owens felt things were getting out of hand, so he took control of things in rather unique fashion. Leinster flanker Sean O’Brien made what looked to be a high tackle after the whistle, sparking a free-for-all on the halfway line that took some time to calm down. The tackle was bad, but the scuffle could easily have been avoided had certain players not got involved. Owens, upon getting no assistance from his two assistants, chose to have a chat to both teams, calling them to him in rather comical fashion for a good old fashioned telling off. “You’re adults, you’ll be treated like it, as long as you act like it,” was the message from Owens to the 30 players on the pitch. It is good to see a referee take control of things, basically bringing these professional players back to grassroots level and making them realise that at the end of the day, the ref is the guy in charge out there. One almost expected them to say ‘Yes sir’ after that. A while back we saw referee Wayne Barnes show his authority in a similar way as he told off two of England rugby’s most senior players, Martin Corry and Steve Borthwick. It’s good to see, and moments like these reiterate why rugby’s values will make sure it maintains its reputation as a fantastic game, played with respect by gentlemen, who just happen to be aggressive. Do you think Owens was spot on, or was it a bit much making such a scene? This week’s frozen weather couldn’t prevent a star-studded Barbarians side running red hot earlier today, putting four tries past current world champions South Africa to win 26-20 at Twickenham. It was a fine way to celebrate 120 years of Baa-Baas rugby, and the skill and ability of this Barbarians team gave thrilling reassurance to one of rugby’s most historic and treasured traditions. Tries from James O’Connor, Quinton Geldenhuys and two from Drew Mitchell proved to be the difference between the sides, although South Africa scored three tries themselves through Odwa Ndungane, Bakkies Botha and Bandise Maku. The Springboks had only retained three of the line-up that beat England last Saturday and had no answer to Mitchell or man-of-the-match countryman Anton van Zyl, who was dominant in the lineout and contributed well in the loose. The Barbarians certainly lived up to their name in the early quarters of the game, providing some entrepreneurial running rugby to warm the 30 000 fans, with a fantastic kick-through from James O’Connor to give Mitchell his second score a particular highlight. Mitchell barged over from close range for his first try before O’Connor scored and converted his own. But when a forced pass from Nonu was intercepted by Springbok wing Ndungane early in the second half, South Africa were handed a lifeline back into the game. There were further scores from Geldenhuys for the Barbarians and Botha and Maku for the South Africans but the result was never in doubt. Barbarians head coach Nick Mallett, who coached South Africa from 1997 to 2000, said he relished the victory: "The first 30 minutes was some of the best rugby I've seen in the November Tests. We cut South Africa to pieces in the first half-hour and left a couple more tries out there. "We got some great ball in the first half but then South Africa put us under pressure in the second. It's a strange feeling when you hear the national anthem of the team you've coached but I take my hat off to these guys." South Africa coach Peter De Villiers did find positives in his side’s defeat: "We lost the game but we won a lot in other respects. It wasn't a Test match but it was a test to see how good we really are with our youngsters and our depth. "Everybody wanted to show what they could do and the team didn't perform as a unit. But we talked at half-time and they pulled it together. Our youngsters did very well." "When a national side gets beaten by an invitation team that's a very important game. It's got huge relevance," he said. A star studded French Barbarians side hosted Tonga this past weekend in what was a great game of rugby that featured some fantastic players, and went right down to the wire. If you don’t know the result, skip to the video now to avoid the spoiler. The French Barbarians side is an invitational team that was made up of players that play domestically in France. 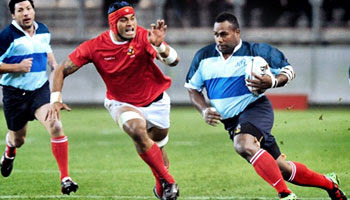 They fielded a strong lineup, with no less than 13 internationally capped players, including the likes of Byron Kelleher, Cedric Heymans, George Smith, Mathieu Bastareaud, and the man everyone wanted to see, Rupeni Caucaunibuca. Tonga were playing their final tour match after previously beating Italy A 16-9. They came back from being 27-9 down against the Barbarians side to take claim an impressive 28-27 win. French replacement Benoit Baby had a chance to win the game with time up, but he hit the post, resulting in a famous win for the tourists that they’ll take a lot of confidence from. Late tries from Viliami Helu, Mateo Malupo, and Ueleni Fono, as well as an all important conversion got them the win. The Barbarians scored a wonderful try through Carl Hayman, and Caucau also crossed. Two missed opportunities late in the game from poor passes, by scrumhalf Kelleher, ultimately proved costly in the end. It was a great game whatever the result, with real ambition shown throughout. Enjoy. Since the weekend we've learnt two things. One is that Richie McCaw has been named IRB Player of the Year again, and the second is that Welsh flanker Andy Powell was not cited for his high shot on the All Blacks captain. The latter has surprised many as it looked by all accounts to be somewhat of cheapshot, a swinging arm that connected with McCaw’s jaw, flooring him unceremoniously. Somehow the ref and his two assistants missed the incident, as did the citing officer. McCaw, clearly shaken, took a while but shrugged off the knock in typical fashion before giving Powell a bit of a death stare. If you look carefully you can see Powell indicating that it wasn’t high, but the video seems to indicate otherwise. As brought up by New Zealand commentator Grant Nisbett, a year ago Dan Carter made a tackle against Wales that wasn’t quite as bad, but he was treated like a criminal, booed by the fans at the Millennium Stadium and vilified in the press afterwards. Powell dodged a bullet on this one somehow, with referee Alan Lewis only signalling a scrum for the McCaw knock-on as he dropped the ball in the hit. The consummate professional that he is, the All Black captain got on with things, leading his side to the Grand Slam win and since having taken a well deserved IRB Player of the Year award. He probably shouldn't have got it last year, but this time around there aren’t too many other players who can rightly challenge for the honour. Do you agree with the award, and what are your thoughts on the tackle going unpunished? Scotland came from behind to take a half time lead and eventually sneak the win as a late Ruaridh Jackson penalty kick helped the home side beat Samoa 19-16 in Aberdeen on Saturday. It’s Scotland’s fifth win in their last six Tests this year. Samoa scored a lovely converted try through their ever impressive scrumhalf Khan Fotuali’i after a neat chip ahead from George Pisi. Nikki Walker then crossed for a rare Scottish try that came from a neatly worked set piece move. Dan Parks kept the scoreboard ticking and at 16-13 up after a dropgoal and a few penalties, it took the boot of Paul Williams to keep Samoa in the game and get things level. Replacement flyhalf Jackson came on for his second ever Test with twenty minutes left and kept his nerve to slot the deciding penalty with time up in front of his home ground. "I've supported Aberdeen since I was a kiddie and loved going to Pittodrie to support them. In those days I imagined that one day I might get the chance to get out on to that pitch and score an important goal," Jackson said. "I was pretty nervous when I prepared to take the penalty. I just lined it up as usual - connected well, and thankfully it sailed between the posts. "OK, it turned out it wasn't for Aberdeen - but you can't get better than claiming the winner for your country. I hope I have also brought back the winning feeling and a bit of sporting joy to the city and that the football lads can take some inspiration and start getting some good results again. "After the final whistle sounded I ran across to my girlfriend Kirsty and her folks - then my mum and dad came down to the side of the pitch and she gave me a huge hug. "It was all just magical," he beamed. Ireland comfortably beat Argentina on Sunday with a 29-9 win at the Aviva Stadium in Dublin. Jonathan Sexton was on superb kicking form while Stephen Ferris and Gordon D’Arcy scored the tries. For Argentina, Felipe Contepomi had an off day with the boot as his kicking at goal wasn’t up to standard, meaning that his side failed to stay in the match earning, Ireland a continued undefeated record at home against the South Americans. Keith Earls nearly scored with a minute left in the game, but the TMO controversially disallowed what looked to be a certain try. D’Arcy made up for it on full time though, crossing after a very neatly executed chip and chase. "We can hold our heads up. To finish with our highest winning margin against Argentina in the last game of the year is a great positive for us going through to the Six Nations," said wing Tommy Bowe. "Whenever we've had dry ball, we've shown that we're able to throw it about. That's the type of rugby that we want to play. We have plenty of players who are willing to play good rugby. When we get the chance, we're able to cut teams open and we'll be looking to do more of that," he added. The bad news for Leinster and Ireland is that Brian O’Driscoll looks to have broken his jaw, which could mean he’ll miss upcoming Heineken Cup games. Rob Kearney will also be out for some time, including the early stages of the Six Nations. The result of this game ends a mixed bag of results for Ireland, with wins over Samoa and Argentina but losses to New Zealand and South Africa, despite playing promising rugby at times. They have shot back up the world rankings however, now sitting at 5th.